Makes one 9-inch deep dish pie or two 8-inch shallow pies. * Since you will need cashews for both the filling and the garnish, remember to soak around 2 cups of dry cashews. It is better to have leftovers than to come up short. * You can use either all pumpkin, all butternut squash, a cushaw squash or a mixture of squashes. I used 1 small butternut squash and 1 small sugar pumpkin for a filling mix. * When you scoop out the flesh of the squash, you will have at least double what the end product will be. Straining the squash will remove a lot of the water content - so when you measure, use the strained squash amount. 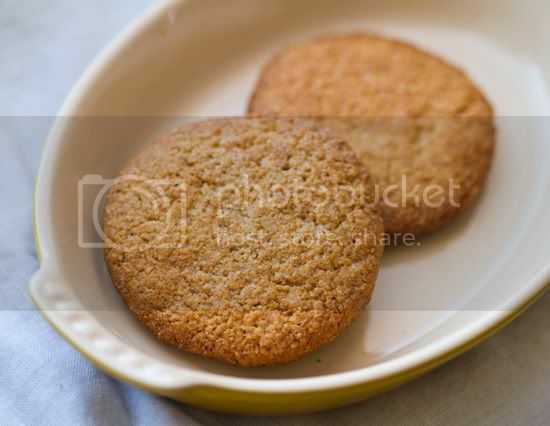 * The gingersnap recipe is the same as linked to - the only difference is that you will chill the cookie dough, then thinly roll it out and cut into circles - so that you can get crisp cookies. You can bake the cookies until they have browning edges. Crisp cookies make a better crust that soft chewy cookies. * You can modify the ratio of cream cheese to cashews if you'd like. Adding more cream cheese will give your pie a more 'cheesecake' taste. Pre: At least 8 hours before: soak your raw cashews in a salted water bath. 1. The first step is the get your pumpkin/squash roasted. Heat your oven to 400 degrees. Slice and de-seed your squash and/or pumpkin. I lay my squash face down in a shallow water bath for roasting. But you can dry-roast if you'd like. I roasted my squash for 60 minutes. Roasting time will depend on how large your pumpkins are. When squash have roasted, pull them from the oven to fully cool before handling. When they are fully cooled, scoop out the flesh. Then pour the flesh into a fine cheesecloth and squeeze out excess moisture. When you are left with a dry puree (dry enough to hold its shape in a ball) you can measure out the 2 3/4 cups of squash. Set aside. Note: some recipe say you can puree the pumpkin first, but I simply wait to puree it with the rest of the ingredients. 2. The next step is to make the gingersnaps. You can do this the night before you make your pie if you'd like. Follow my recipe for ginger cookies - only for the last step, you will chill the dough for about 30 minutes. Then roll the dough out thinly so you can get crisp baked cookies. Bake the cookies until the edges brown. Then chill the cookies completely. Stick them in the freezer for fast chilling. 3. Once the cookies are chilled you can make your crust. Combine 10 cookies in your food processor with 2-3 Tbsp of chilled vegan buttery spread. 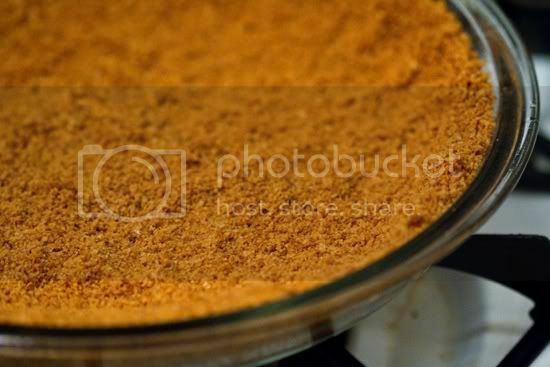 Pulse until the crumbs are finely ground and mixed with the spread. 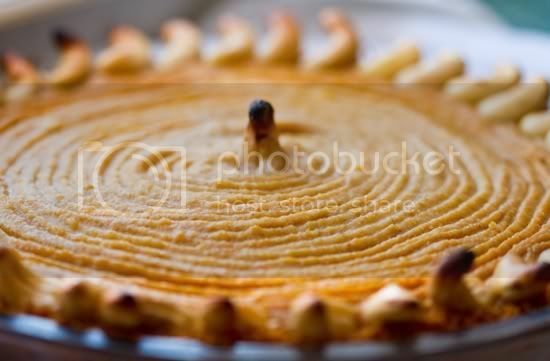 Pour the crumbs into your pie tin and press into place with your fingers. Note: if you are using two shallow pie tins, you may need to increase the amount of crumbs, so you will need 15 cookies to crush. (also depends on size of your cookies). 4. In a 400 degree oven, bake your crust for about ten minutes - until the crumbs get darker brown and crisp. Set the pie crust aside to cool. 5. Now that you have your squash puree, your crust and your cashews soaked, you can start the easy part! In a food processor, combine the tofu cream cheese, soaked cashews, cinnamon, 1 tsp salt (half of total) and maple syrup. Puree until very smooth. Scoop out about 1/2 cup of this mixture and set aside. Leave the rest of the mixture in the food processor. 6. Next, add in all the remaining pie filling ingredients (squash/pumpkin puree, vanilla extract, all the spices, remaining salt and sugar. Puree until smooth and creamy. 7. Make sure the oven is preheated to 400 degrees. 8. 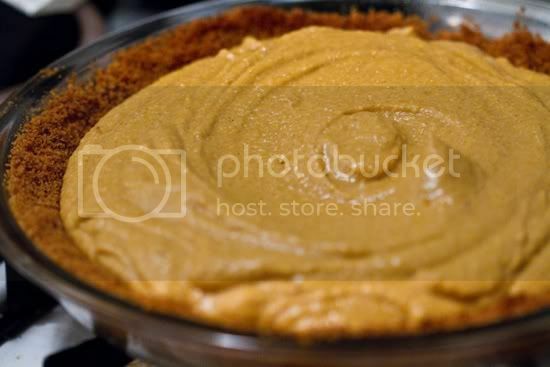 Pour the pie filling over the gingersnap crust. Smooth out with the back of a spoon. 9. Grab your reserved cream cheese/cashew mixture and swirl that into the top layer. You can swirl it so it blends into a soft orange color, or keep it in true orange/white swirls. I like to make a design using a fork. The mixture should be thick enough so that a fork brushed over top, will leave a pattern. 10. Lastly, soak about 30-40 leftover cashews in maple syrup and a pinch of salt. (Make sure the cashews are well drained and dry so that they absorb some of the maple flavor.) 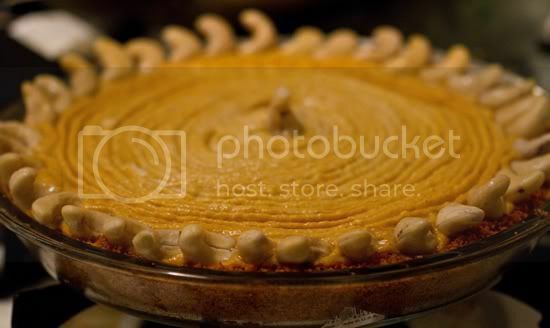 Line the cashews around the edge of the pie and one in the center. 11. Bake at 400 degrees for the first 15 minutes. Then turn the heat down to 350 and bake for another 20-30 minutes. If you want a softer, custard-y pie, bake less. If you want a firmer, drier pie bake longer. 12. Chill in the fridge before serving. Enjoy and (pat yourself on the back) good job!!! * I used white whole wheat flour from Trader Joe's. Any flour variety will work though. * Adding more molasses will make the cookies darker and bolder. But don't add more than 1/2 cup - because the flavor will be too strong. Molasses is bold. * If you substitute the butter spread with vegetable oil, add in an extra dash of salt. * If your dough seems too dry - simply add water in 1 tsp intervals until the dough meshes perfectly - in a Playdough like consistency. 2. Soften the vegan butter spread in the microwave. Set aside. 3. In a large mixing bowl, combine the dry ingredients: flour, sugar, ginger powder, cinnamon, salt, baking soda/powder. Mix well. 4. In a separate bowl, combine the softened buttery spread, molasses, vanilla extract, grated ginger and water. 5. Combine the wet and dry ingredients and stir by hand well until all the ingredients are blended into a moist ball of dough. The dough will seem dry at first, but keep stirring and folding and it will come together. If needed add in extra water one spoonful at a time until the dough consistency is reached. 7. Bake at 375 for 9 minutes. 8. Allow the cookies to cook at least 15 minutes before serving. They will harden as they cool as well as overnight. From Caroline's Garden of Vegan, Myspace.